Adding flaxseed to your diet is an easy way to add fiber and omega-3 without taking pills. Flaxseed is a full-powered nutrient that adds benefits without changing the texture or taste of your food. Viva Labs Organic Ground Flaxseed boosts heart health as well as digestion. These seeds are finely ground to the softest grade making for easier digestion and added fiber. Each serving offers 3g of dietary fiber. When added to food, this fiber boost will help you feel fuller longer. This flaxseed is certified organic and non-GMO. It is allergen friendly and grown by specially selected Canadian farmers to guarantee quality. I’m sure that you could even think of more ways to add Flaxseed to your diet. I don’t like adding more pills to my morning vitamins, so rather than taking a flaxseed oil vitamin, this is a much easier way to add Flaxseed to my diet along with the many benefits. When I make up my smoothie bags for the freezer, I add a scoop of Flaxseed to each one. I have also frequently added it to pancakes, muffins, and banana bread. The kids have no idea I have added it and they are getting all the great nutrients Flaxseed offers. 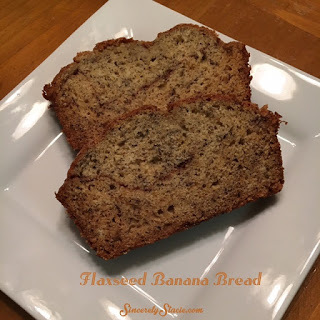 You don’t need any special recipe, you can just add it to your regular recipe for banana bread, muffins, etc and you won’t notice any difference. To maintain the benefits of Flaxseed, I keep mine in the refrigerator after opening. It can also be kept in the freezer. I have tried many Viva Lab products and I have been very impressed with the importance they place on high-quality, organic items. To see more of their great product line, click HERE. Thanks to Viva Labs for sending this product for the purpose of this review. This review is my honest opinion. I was not compensated in any way for this review. If you choose to purchase this product through the above link, I may receive a small commission without you having to pay a cent more for your purchase. Thanks for supporting SincerelyStacie.com.